It is often said when we want to attribute supernatural powers on someone that they could walk on water. Well on Saturday in saturated Lurgan Park ( I’ve never seen dry Lurgan) several hundred men and women attempted an even more difficult task, namely staying upright on liquid mud – while running! writes Joe Quinn. I’m happy to report that virtually every one of the near 400 participants and all of the East Down contingent managed to do so in the consistently worst cross country conditions I have ever seen. It was a 2K circuit which had at least six inches of liquid mud throughout its entirety but this was the best of the going. In other places the course was under water and in some the mud was over a foot deep. So congratulations not only to Newcastle AC for a magnificent performance in regaining the Junior team trophy after a lapse of 27 years, but to every athlete who took part. Gareth Kelly was the only East Down man to take part in the Junior race, his first incursion into the world of cross country, and what a baptism he chose. If it had been one of fire at least it might have dried out the course little, but nevertheless he performed very well, was undaunted at the end and can’t wait for the next one. The East Down men targeted the Masters race over a gruelling 8K, fielding not one but two strong teams and were rewarded with 7th and 18th places in a very competitive race. The A team was led home by Barrie Atkinson in a magnificent 12th place, showing the improved confidence generated by his win at the International event at Greenmount three weeks ago. 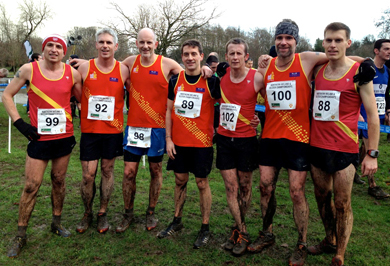 The other team scores were Michael Cultra 31st, Martin Willcox 43rd and Paul Burns 48th. The other team runners were Declan teague and Mark McDowellThe most satisfying run of the race has to be Francis Tumelty’s 80th place which was a welcome return to form following a long term injury, as he led the B team to 18th place, a mark which could have been 13th with more judicious selection and more recent form to go on. Just wait for next year! 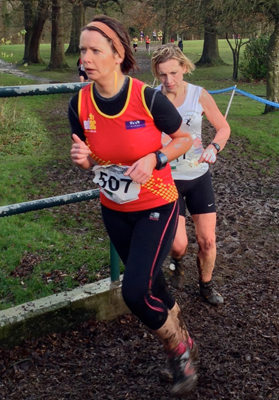 Tracey McDowell heads for the finishing line through the mud. The other B team scorers were Phillip Vint 102nd, Michael McKeown 126th and Stephen McCartan 141st with sterling back up from Peter Morgan, Kieran McMahon and Michael Degan. Not to be outdone, as indeed they weren’t, East Down’s Ladies also turned out in force, having enjoyed their maiden cross country outing at the same venue last year and returning in the sure knowledge that conditions could not be as bad as last year. How right they were. In fact they were much worse! But to their credit there was not a word o complaint. Well not that I heard anyway but perhaps exhaustion stills the tongue! Two laps was the distance and one of the outstanding performances of the day was Laura Gardiner’s 12th place, well ahead of many experienced and high class cross country athletes. When she has another year of experience and strengthening she will be a live contender for medals in this event. In retrospect had the East Down team been able to field its strongest team it would have been in serious contention for a podium place. As it was, Catherine O’Connor 21st, Tracey McDowell 52nd and Betty McCartan 60th combined with Laura to take 5th place in the Intermediate Team category, a magnificent achievement. Others in the A team were Cathy Burke, Kim Surginor, Oonagh Brétéché and Paula Savage. Overall performance of the day award however must go to Lisa Milligan who steadily worked her way through the field to take 65th place and lead the B team to 11th place ably supported by Helen Vint, Linda Cunningham, Carmel Tumelty, Joanne Carson and Elaine Byrne. The miserable weather saw good use being made of for the Club’s new gazebo where shivering runners could huddle before and after their races and leave their baggage while they ran knowing that they would return to dry clothing afterwards. It was also the scene of the best East Down team performance of the day when in a magnificent combined effort the mud spattered runners and one or two who were not proved themselves world champions at sandwich eating and bun disposal. So given the success of Newcastle and the upsurge in interest in cross country running in the East Down it is to be hoped that both clubs will participate in all the League fixtures next year, with Ballydrain Harriers and perhaps Murlough coming on board to have some fun in a Co. Down league, based on the same scoring system as the main league itself. Next Saturday it’s the Rolercoaster races at Downpatrick Racecourse beginning at 12.00 noon. Entries for all races taken on the day, Everyone welcome. No mud guaranteed. Medals for all in Children’s races and refreshments afterwards for all competitors.